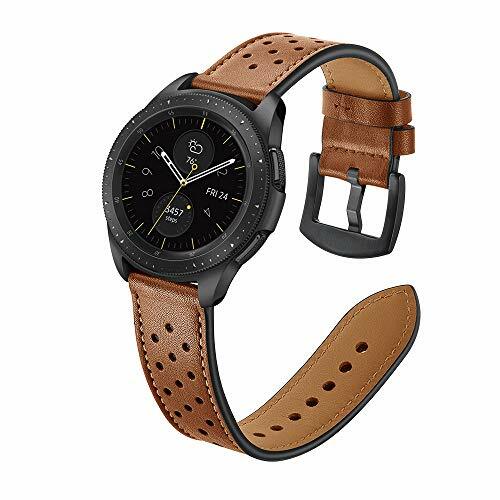 22mm Watch Band, OXWALLEN Leather Watch Band, Quick Release Soft Watch Strap Brown with Black Buckle | What Should I Say? Hand-made quality straps,make your watches more tasteful! Compatible Models: Our bands Not only fit brands listed, are compatible with any watches ( including traditional and smart watch) which use the standard spring bars with the width of 20mm-22mm.To determine proper width for your watch,measure the width where current band attaches to the watch head.It is important that the width of the ear of the watch exactly matches the width of the band you choose. Measure the distance between the belt and the case. Q: Is this band genuine leather or faux leather? A: This 22mm leather band is made of cowhide . It is skin-friendly and comfortable touch feeling on your wrist. Q: Dose this have the quick release pins? A: Yes, this leather band has the quick release pins. Very easy to install and remove. Material: 100% full grain genuine leather replacement belt.Treated underside is ultra-soft against the skin and minimizes slipping while providing ideal comfort. Quick Release design: easily install and replace tapes in seconds, without any tools, just simply slide quick release knob with finger as picture. Soft lined, wearable, polished solid stainless steel buckle. Dry speed, exclusion sweat, other moisture and dirt. Keep your wrist dry and comfortable. WARRANTY: 100% CE Satisfaction Guarantee for 1 year and refund without question in 15 days. If you have any problems with your order please contact us for prompt and courteous service. If you have any questions about this product by OXWALLEN, contact us by completing and submitting the form below. If you are looking for a specif part number, please include it with your message.